JHP Fasteners is an international, master distributor of industrial fastening products for sheet metal fabrication. Excellent customer service, high quality products, an extensive inventory, and competitive pricing are at the core of our company. We offer a rare combination of product knowledge and application, making JHP Fasteners a leader in fastener distribution. Click here to see our core fasteners line card. At JHP Fasteners, we have thousands of inch and metric fasteners in stock and ready to ship. If we don’t have it in stock, we’ll get it and our promise of a fast turnaround ensures we will work to acquire the product quickly. We supply fastening products for all type of metal chassis, selling the products and provide services that other distributors don’t offer. No matter what metal fastener you need, we have or will find the right one for you! Our engineers can work with you to determine the fasteners that will work best in your application. We service precision metal fabricators, end users, and other distributors in all their fastening requests. Our employees have applicable knowledge for the products we sell as we’ve worked closely with operators and engineers in the metal shops. We not only receive your order, we understand it. We know it’s a rush and we do everything we can to get it to you quickly and efficiently. We distribute all types of sheet metal fasteners to various industrial markets including computers, copiers, furniture, electrical enclosures, PCB assemblies, gaming machines, home appliances, and automotive markets. Our tooling and machinery products include self-clinching fastener Insertion equipment, welding equipment, and other fastener installation tooling. Used tools and machinery are also available from JHP Fasteners. To learn more about our Fastener Installation Tools as well as our Fastener Product lines Contact JHP Fasteners Today! 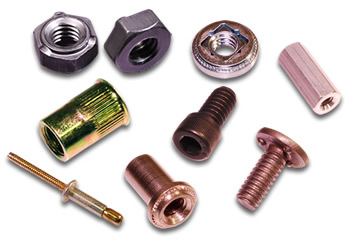 Request a Quote today for any of our fastener products. Or to find out which fasteners will work best for your applications, contact us today!